Slice roma tomato into 5 or 6 slices (as thin or thick as you prefer) and place into a small bowl. Pour olive oil over tomatoes. Sprinkle garlic salt, pepper and oregano on top of tomatoes, to taste. Toss to ensure even coverage. Place tomatoes on a small cookie sheet and cook for 10 minutes. Meanwhile, slice mozzarella into 6 thin slices. Spray a small pan with Pam (as needed) and warm over medium-low heat. 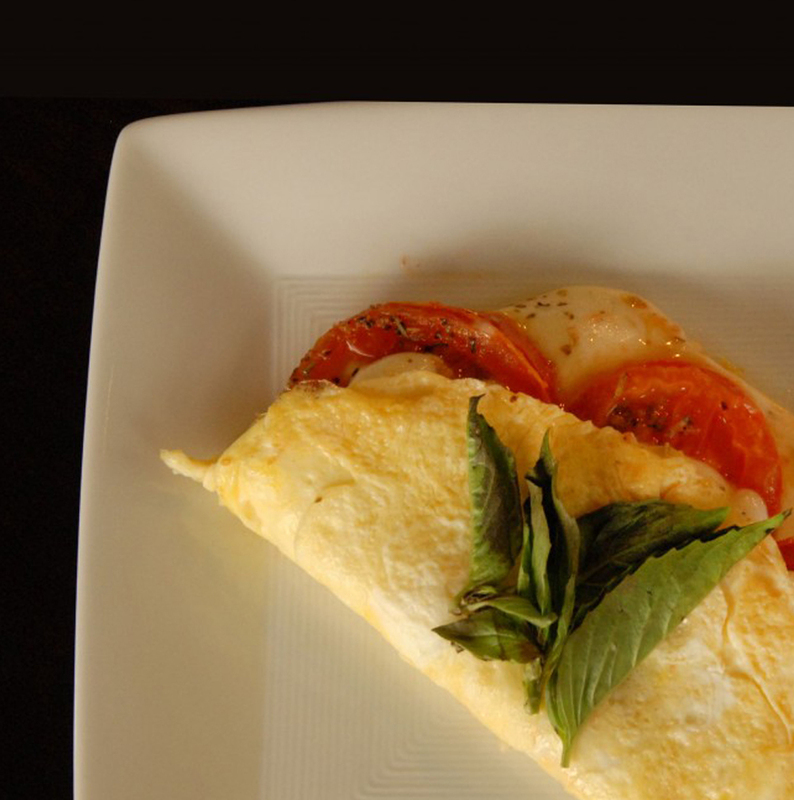 Combine egg whites and egg into a bowl and scramble. Pour eggs into the pan and with a heat-resistant rubber spatula, gently push one edge of the egg into the center of the pan, while tilting the pan to allow the still liquid egg to flow in underneath. Repeat with the other edges, until there's no liquid left. Gently flip the egg pancake over, using your spatula if necessary. Add half of the mozzarella to one half of the egg pancake. Add tomatoes on top of mozzarella. Add remaining mozzarella on top of tomatoes. Cook for one to two minutes, fold over and top with basil leaves. To say that I fell in love with margherita pizza while in Italy would be an understatement. Unfortunately, eating pizza everyday is not great for the waistline. Instead, I decided to incorporate the basic ingredients into an omelet and the results were... eccellente!